I have been a high volume small incision cataract surgeon for the last decade. One of my interests has been in developing teaching techniques to reduce trainees intraoperative complications to an absolute minimum while on the learning curve. My textbook "Phacoemulsification: Step by Step" was first published in 2001. This was one of the first ophthalmic texts to feature an attached video cd. Technology has moved on and I now think the internet via broadband access will be the means of delivering future training. It is vital not to restrict the access to knowledge, and to this end phacotutorials.info will always remain free to the user. initiative used to deliver undergraduate ophthalmology teaching in Oxford. I am a Locum Consultant at Gloucestershire Hospitals NHS Trust. 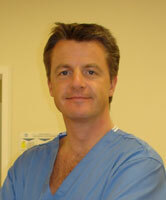 I have a special interest in uveitis and surgical retina and I perform routine and complex cataract surgery. I am passionate about teaching and I enjoy teaching at any capacity or level. I am currently an ST5 on the Severn Rotation. I thoroughly enjoy teaching and have previously designed and implemented the Ophthalmology University of Bristol E-learning seminars (MDEMO module). In addition I have recently completed a post graduate Certificate in Teaching & Learning for Health Professionals (TLHP) at the University of Bristol.